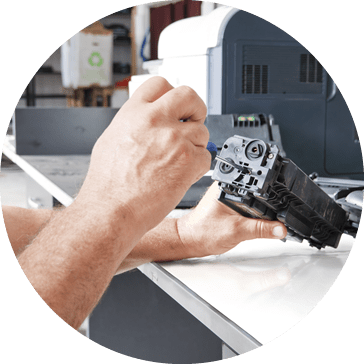 Reach Technologies service organization maintains certified trained technicians who provide maintenance and repair on most printers, copiers, plotters and fax machines; both locally and nationally. Reach uses a state of art service software tool, enabling us to track service tickets from initial input to closure. We contact every customer prior to dispatching a technician to diagnose the problem and provide an ETA (estimated time of arrival). We maintain a large inventory of service parts in our main warehouse and all service vehicles. We are an authorized service center for HP, Copystar/Kyocera, Lexmark, Brother, KIP, Oki and Xerox. Our goal is to provide 1st time system repair resolution, meet customer service level requirements, and supply a 100% satisfaction guarantee on all services provided.